Unless you've been asleep for the last 7 days, you would have heard about Italian Vogue's upcoming July issue featuring only black models. 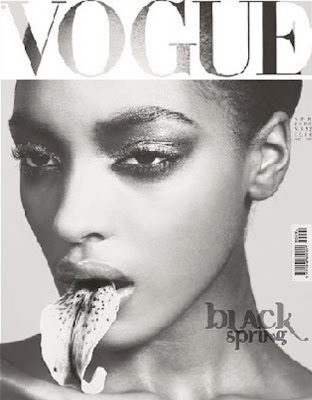 The special issue include more than 100 pages of black-"ness", including the cover, which features images of black women taken by the acclaimed New York based photographer Steven Meisel. The pictures will be accompanied by articles on successful black women in arts and entertainment. This issue has been regarded as "A breakthrough in fashion barriers"....what angers us is this idea that this edition is expected to be the worst-ever selling by the renowned publishers. Industry insiders claim black girls just "do not sell". What does that mean? Is that implying that Vogue enthusiasts will suddenly not by their favourite read because a black woman is on the cover or black people don't have buying power or they can't read or are simply unfashionable? I will not answer any of these questions cause these implications are simply too disturbing to comprehend.